Welcome to our Awrel Newsletter, designed to accelerate productivity and improve quality in the dental industry. Here, we'll share valuable insights for dental professionals working in the newest era of digital communications and collaboration. We're pleased to provide information about the power and value of technologies that enhance quality while supercharging workflow and productivity — making your patients, clients and customers more satisfied and your organization more profitable. P.S. Three years ago, I started a project called Awrel to develop a HIPAA-compliant texting application. My goal was to make it quicker and easier for dentists and labs to share and store information in a secure environment. Today, we're pleased to offer our texting app as a free service. Learn more about powerful capabilities to overcome hassles and delays associated with email and portal-based communication. This case study demonstrates the planning and execution of a retrievable single restoration in the esthetic zone. Instead of using a cement-retained crown to a custom abutment, we used angled screw access. The case highlights the steps associated with the procedure and its positive outcome. It also identifies benefits of using a HIPAA-compliant texting application to efficiently and securely communicate with the referring dentist, lab and patient. How Can Secure Texting Help Increase Efficiency and Reduce Costs? Secure messaging solutions provide a series of efficiency-increasing and cost-reducing benefits, according to an article titled HIPAA Rules for Dentists. With secure messaging, information is transmitted to the correct recipient, users save time and money, and the integrity of patient data is protected. Authors of the HIPAA Journal article state that all of this happens "in compliance with the HIPAA rules for dentists" and add that "secure messaging solutions are not difficult to implement." In the same article, authors state that complying with the HIPAA Security Rule can present a headache for many dental offices. They recommend implementing a system of secure messaging. "Unlike (personal) email, SMS or Skype, secure messaging is conducted within a private network only accessible by authorized users. Users can access patient data and communicate it with other authorized users only after they log in to secure messaging apps which require user authentication via a unique centrally-issued username and password. All patient data is encrypted at rest and in transit, so it is perfectly safe to send text messages, share images." If you or your colleagues are texting outside of a secure messaging environment, beware. Attempts to save time in the short run can be costly in the long run. Consider reviewing this article titled HIPAA Audits May Come for Dentists from the American Dental Association. What Will Happen to Dental Labs? In a just-published article Dental Economics the chief editor of Dental Economics highlights consolidation and states that "the age of one or two technicians working in their basements is largely over." He describes how Blockbuster Video, Tower Records and Kmart have faced extinction in recent years and asks, "What happened, and will it happen to dental labs?" Thanks to Dr. Chris Salierno for sharing this valuable perspective. Salierno believes we are in a "turbulent transition time" when "dental practices and labs would be wise to reevaluate their business models and revenue streams along the way." HIPAA-complaint texting and voice-guided implant ordering solutions offer new opportunities for dentists and labs to streamline workflow. Are you using the newest communication and collaboration tools? In November, the dental industry witnessed a game-changing advance in technology. 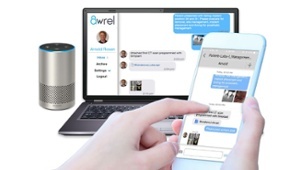 Awrel unveiled its new Awrel Partners Portal™ Platform, which enables dental supply companies and labs to provide their customers with intelligent, voice-guided ordering of implants, supplies and equipment. 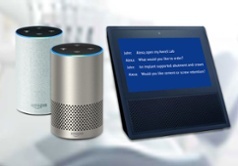 With this powerful capability, companies can readily extend order processing capabilities beyond current paper-, web- and mobile-based forms to environments that deliver next-generation conversational voice experiences. Meet us in the Windy City! Here's your chance to see our productivity solutions and talk with our experts about the strategic and operational impact you can realize with voice-enabled ordering and HIPAA-compliant texting. Schedule your meeting today. Is Your Text Messaging Service HIPAA Compliant? Please pass this newsletter along to colleagues. Encourage them to sign up for our newsletter here.